Digital marketing and associated trends are constantly changing, and marketers are tasked with understanding and meeting these changes head on. From artificial intelligence to rising data intelligence and brand safety, Sendmode has brought together the latest digital marketing trends for this year. As we enter the second half of the year, organisations are facing more and more challenges when it comes to digital marketing. With growth and revenue a priority for most businesses, 47% of marketing professionals this year have focused on converting leads to customers, while over half prioritized increasing traffic to their websites. Artificial intelligence (A.I) has been the ‘big data’ buzzword of 2017. Everyone is talking about it but very few businesses are actually doing anything with A.I. “This current trend, as well as data analytics, identifies applicable A.I solutions as a way for consumers to navigate in an increasingly complex world,” DeBroff. We’ve seen a growth in the number of larger internet companies using A.I to assist in many of the operational tasks such as recommendations and cross selling. A.I is closely followed by machine learning to understand how to best improve customer understanding. A.I solutions can take large amounts of consumer and market data, segment and analyse this data at a beyond human level, and present findings back to marketers that enable intelligent campaigns and execution. With artificial intelligence solutions on their sides, marketers can focus on high-impact strategy, content, and execution. At the beginning of 2017 Harris (CEO of Elumynt, a digital marketing agency) stated that content would remain king. And he wasn’t wrong, according to Groundreport, Google prefers websites with quality content that has the ability to provide useful information to visitors. For many brands, content marketing is crucial. For start-ups, it’s the most important growth channel. The value of content marketing is undisputed. A recent study by Smart Insights and Hubspot found that 53% of marketers see clear ROI and 43% at least see opportunities. In the current digital landscape, engagement is everything, and marketers succeed when their audience not only consumes content but also enjoys and acts upon it, which is why interactive content is important for marketers going forward. 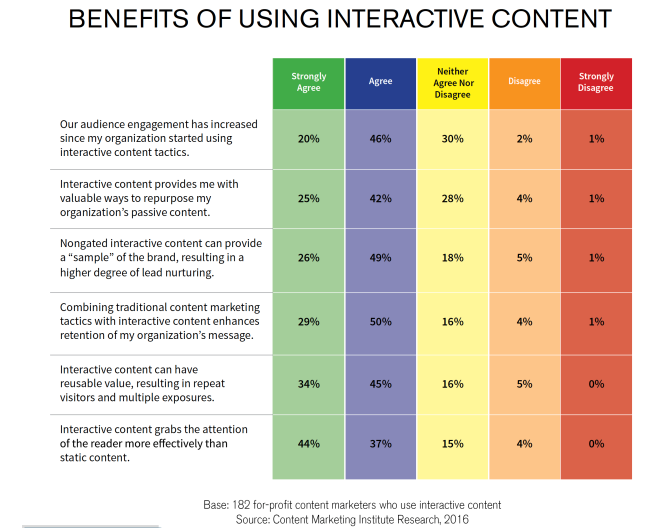 Compared to 36% static content, interactive content generates conversions very well. Although not a new concept to 2017, there has been plenty of buzz about social media and marketing, and rightly so – brands have to invest serious time and resources in social strategies. With more social media outlets than ever before, consumers will have their attention stretched to the absolute limits. For digital marketers, social media can actually present an opportunity to leverage consumer relationships and turn them into revenue. Big Data marketing applications include marketing and customer insight and predictive analytics. The 3Vs of Big Data (Velocity, Volume, and Variety) show why this is a key trend selected by any who have experienced the increase in volume, real-time data and data formats in their business and want to exploit the value to increase sales through varies marketing techniques. Big Data is also very closely tied to machine learning. Probably the most impactful B2B marketing trend in 2017, brands have put a tighter focus on improving the customer experience while driving growth. Instead of focusing solely on “customer-centric” methods based on customers’ lifetime value, brands are utilizing customer-focused techniques, enabling them to provide relevant experiences across all areas of business and concentrating on what the customer values most. These are to name but a few of the big digital marketing trends we have seen thus far in 2017. Mobile marketing, influencer marketing, and such trends will undoubtedly continue to grow in 2017 and the industry will continue to develop at a rate marketers will be focus to keep up with.